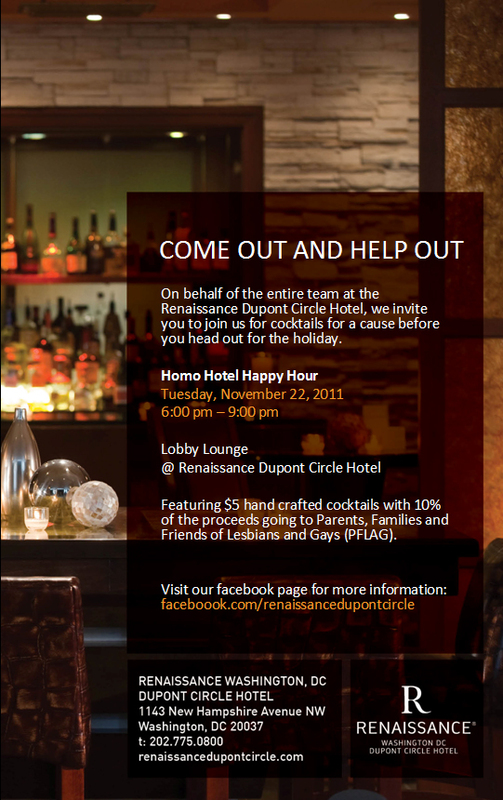 Homo Hotel Happy Hour is back this week. We’ll be soaking up the last weeks of summer on the roof of the Donovan House. 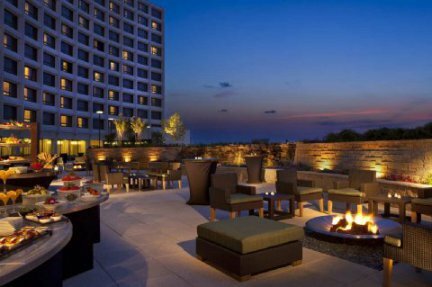 Additionally, Kimpton Hotels and Restaurants, the International Gay and Lesbian Travel Association (IGLTA) and Barefoot Wine will be sponsoring a special suite with a limited supply of FREE drinks, Barefoot Wine and light fare. The first 75 people to RSVP will have access to this suite. UPDATE: The RSVP list for the Barefoot Suite is now full. First come, first serve. Programming on the roof will is business as usual. Donovan House is offering the following happy hour specials. Please take advantage of these specials and brands, because others could be higher. I will be putting together a special playlist to be Thursday night’s happy hour soundtrack. See you soon. Homo Hotel Happy Hour: Pride Edition with Jetblue Tickets Giveaway! 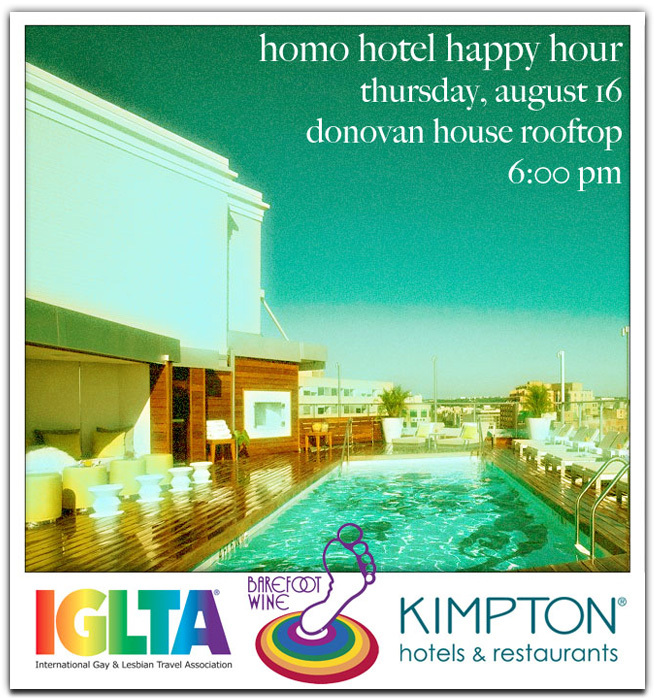 Homo Hotel Happy Hour has been on a homo hiatus, but is back for a special pride week edition on Thursday, June 7. Let’s all reconnect at the Hilton Washington’s Heights Courtyard and kick-off the summer and the weekend’s Pride festivities. Drink tickets may be purchased upon arrival. These prices DO include TAX and GRATUITY. In case of rain, we will move just indoors to the light-filled corridor. I will be giving away two(2) Jetblue tickets on any of their routes. In order to be eligible you must RSVP as a YES to the event by noon on Thursday, June 7 and be present the day of. All YES respondents will be assigned a number and that number will be drawn the day of the event and announced the following day. The winning number will receive both tickets. Facebook basically destroyed the original HHHH group, so I’d really appreciate your help in getting the word out to your friends. Please feel free to invite anyone! Everyone is welcome. 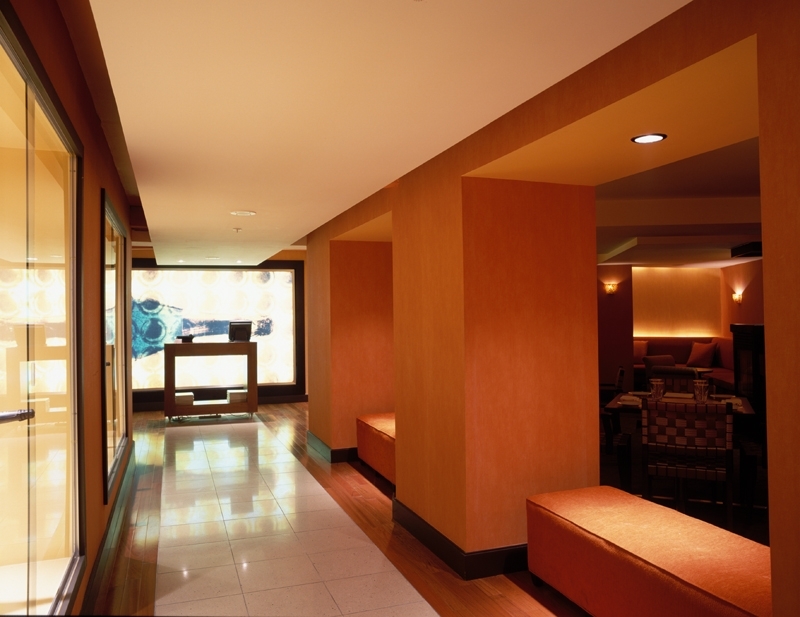 We’re starting 2012 out by returning to the Washington Circle Hotel’s Circle Bistro. Circle Bistro’s cozy and intimate lounge is perfect for the dead of winter. 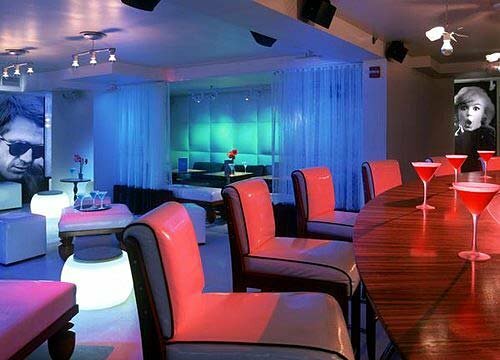 The entire lounge will be ours with a fully staffed main bar and a satellite bar. I hope you can join me and your fellow HHHHers! ‘Tis the season for gathering and drinking. 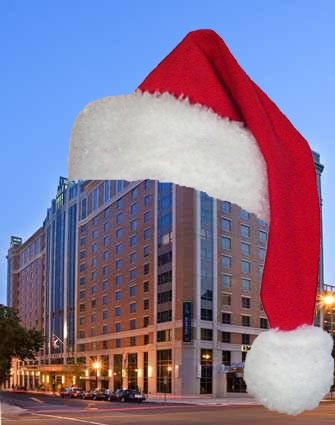 Thus, we’re returning to the Embassy Suites Hotel Downtown for a Holiday Homo Hotel Happy Hour. We’re in our usual spot, taking over the entire Finn & Porter restaurant. Stop by after work for a festive drink or three. A staffed Coat Check will be available on site for $2. The music video wall is back this month, featuring Pop Music Videos from around the world (and probably All I Want For Christmas by Mariah Carey featured more than once) to get you in the mood for the inaugural Pop Goes The World dance party the following evening. Join me and the other HHHHers for a little liquid Thanksgiving. 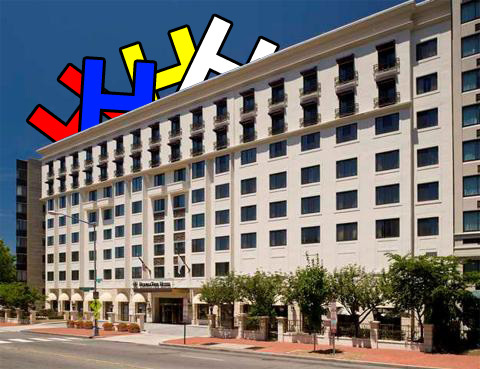 We’ll be returning to the Renaissance Washington, DC Dupont Circle Hotel this month. As we’ve been doing for the past few years, we’ll be meeting on the Tuesday before Thanksgiving. It’s sort of like a Thursday and always seems to draw a good crowd. There won’t be a drink ticket system this month. Helpful hint: Having cash on hand helps to keep the transactions quick. This month, 10% of the proceeds from the specialty $5 handcrafted cocktails will go to support PFLAG. Come out to see your friends before the holiday and to support a good cause. Thank you everyone for supporting Homo Hotel Happy Hour for four great years! Join me in celebrating our fourth anniversary at the Hotel Helix this Thursday. This month, the Hotel Helix will be supplying more bar staff than ever. The satellite bars will be restructured to better handle the flow of traffic. We’ll be implementing a drink ticket system to minimize any potential lines at the bars. Cashiers will accept cash and credit, with one exclusive cash only lane. Drink tickets will not include gratuity, please remember to tip your bartenders. Here’s to four years! See you Thursday. This month, you can choose to be indoors or outdoors. We’re returning to the Doubletree Hotel on Rhode Island Ave. We’ll have bars in both the inside space and the interior courtyard terrace. We’ll be using the drink ticket system at this venue. It really does help with efficiency at the bars. There will be one cashier accepting both credit cards and cash and the other(s) just cash, but cash will alway speed things up! Tax and gratuity are both already INCLUDED in your drink ticket prices.